It has been years since I did something like this! For those who don’t know at one point in my life I ran a business in England buying, selling, fixing laptops and other related computing articles. Back then one of the most common causes of frequent laptop crashes used to be over-heating of laptop’s core due to faded heat paste or thermal pads under the heat sinks. The cure involved taking apart the laptop in question and applying a fresh quote of a good thermal paste under the appropriate places in the laptop’s heat sink assembly and clearing away dust from fans and vents. 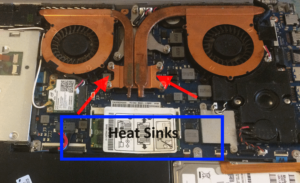 This post of mine is a very brief explanation of how this all works in a laptop and how I took apart my Samsung Chronos laptop today to fix the heating issue. Be it a desktop computer or a laptop notebook they all contain a device designed to dissipate heat away from the major chips inside these devices. The CPU inside a laptop or a good GPU produces significant amount of heat which if not vented out can literally melt the components inside the laptop. To be able to do that laptops are fitted with devices that are called heat sinks. Heat sinks works on the principle of Conduction. Conduction occurs when two objects with different temperatures come into contact with one another. At the point where the two objects meet, the faster moving molecules of the warmer object crash into the slower moving molecules of the cooler object. When this happens, the faster moving molecules from the warmer object give energy to the slower moving molecules, which in turn heats the cooler object. This process is known as thermal conductivity, which is how heat sinks transfer heat away from the computer’s processor. Heat sinks are usually made of metal, which serves as the thermal conductor that carries heat away from the CPU. However, there are pros and cons to using every type of metal. First, each metal has a different level of thermal conductivity. The higher the thermal conductivity of the metal, the more efficient it is at transferring heat. The figure below shows a typical heat sink assembly (my laptop). Heat sinks work on the principle of Conduction. In essence heat sinks are like radiators in the car. They are designed to disperse the heat away from the main chips in a laptop. The fan circulates the heat out of the laptop while the metallic tubes are designed to carry the heat away from the chips towards the fine so that the heat can be vented out. Based on the design of the laptop the metallic conductor tube sits directly over the chip that it is designed to protect. However the metallic conductor does not touch the chip directly, well at least it is not supposed to. Between the thermal conductor and the chip a thick layer of a thermal grease or a thermal pad is placed which is a kind of thermally conductive (but usually electrically insulating) adhesive.The grease gives a mechanical strength to the bond between the heat sink and heat source, but more importantly, it eliminates air gaps or spaces (which act as thermal insulator) from the interface area. This evening I decided to take apart my own Samsung Chronos series 7 laptop to fix the astonishing amount of heat that the laptop was generating. And yes I did it with my two young ones running an absolute racket all around me knocking over my tool kits, screws and what not. Thankfully getting to the heat sinks in this model of Samsung was relatively easy. Usually in the older models one has to completely disassemble the laptop to get to the inners however in this laptop all I had to do was to prize away the bottom casing and voila! I was looking at the heart of my laptop with its two heat sinks sitting snug over the main Intel CPU and nVidia GPU chips. I un-screwed the spring nuts and the other common Philip nuts holding the heat sinks in place and was confronted by the absolutely caked away remnants of the original heat paste that must have been put in the laptop when it was manufactured. The caked away heat paste and the accumulated dust in the vents of the heat sink fans are the most common problems leading to laptop over heating. The best way to remove this caked up paste is to use a soft clean cotton ball and denatured alcohol. You can also easily use Acetone or common nail polish remover if you don’t have denatured alcohol to hand. I ended up using my dear wife’s nail polish remover today myself. Please be careful to not use water or normal alcohol as they would both take ages to dry and the mineral contamination in the water can actually damage the sensitive thermal conducting material that the heat sink is made of. Do not use water or normal alcohol to clean heat sinks. Use acetone or denatured alcohol (medical alcohol). Once the heat sinks had been cleaned of the old paste I used my trusted Arctic Silver Thermal Paste carefully on the main chips and the heat sink surface both. Be careful to not put too much if you are handling it yourself. We don’t want the thermal paste to come out of the contact area once the heat sink presses back onto the chip and spill over the motherboard. Normally I use a good mixture of compressed air to clean out the vents of the heat sink. However I did not have a can handy and as you can probably see the vents were clear anyways. I used a cotton ear bud to gently stroke away some accumulated dust from the vents of the heat sinks and finally it was a matter of putting everything back together which trust me is way more difficult than opening it all up. I can’t even count the number of cases where I put the laptop back together and was always left with a few screws still left to be put in somewhere…where though? I had no clue!